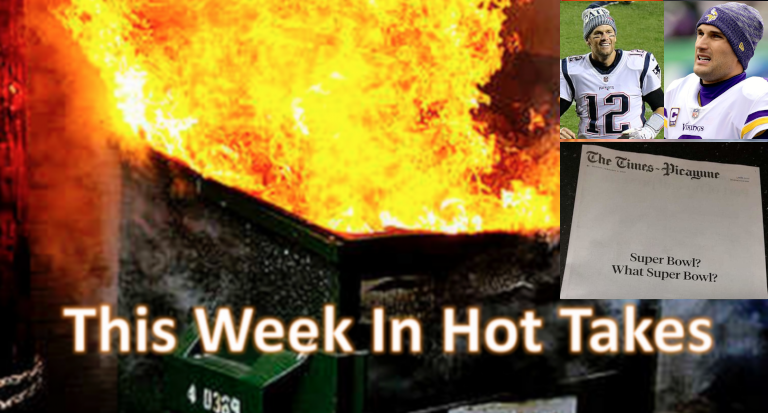 This Week In Hot Takes: Tom Jones says the Times-Picayune "wasted an entire front page"
"Combine middle-school humor with plenty of bitterness and what do you get? Monday’s front page of the Times-Picayune." As many have said before, by that logic, Skip should bay less. Or just stop talking altogether. McVay worked with Cousins in Washington, and McVay continues to have a high opinion of Cousins’ abilities. With Goff playing well enough during McVay’s first year in L.A. to make keeping the 2016 first-rounder around a no-brainer, McVay’s team never was in the market for Cousins. Two years from now, McVay may feel very differently. He already may feel differently now, after digesting Goff’s performance on Sunday. This regular season, Goff threw for 4,688 yards and 32 touchdowns, with 12 interceptions and a 64.9 percent completion rate. Cousins, by contrast, threw for 4,298 yards and 30 touchdowns, with 10 interceptions and a 70.1 percent completion rate; that’s not far off Goff’s numbers, but there isn’t much there to suggest that Cousins is clearly better. And maybe the bigger factor is age; Cousins is currently 30, so he’ll be 32 when his contract expires after the 2020-21 season, while Goff is just 24 (so he’ll be 26). Of course, Goff’s performance could fall off a cliff, and the Rams could have to go looking for a replacement after 2020-21 (or even sooner). But it seems a bit silly to not only predict that thanks to one bad game against a tough defense, but to even lay out a specific replacement the Rams might target, and one that doesn’t feel like an upgrade to many. Maybe Florio will be proven right in the 2021 offseason, and if so, we’ll reduce his points accordingly then. Until then, this feels like a hot take. Nah, the absolute worst is when ESPN pundits criticize consumers’ viewing behavior just because they feel like it. This is dumb on a few levels. First, the proposal there isn’t close to an actual proposal yet, it’s an idea floated by one congresswoman. Beyond that, it’s not a 70 percent tax in general, but a marginal tax; in this case, she’s proposing a 70 percent tax rate only when it comes to income beyond $10 million annually, a marginal rate that corresponds to (or is below) the top rate from 1936-81. So Crenshaw’s first misstating what the actual proposal is. And he’s then ignoring that professional sports leagues do actually “tax the rich” in a variety of ways that go well beyond “a 70 percent tax”, from luxury tax penalties to salary cap penalties to lower draft picks for teams that do well. Thanks to winning the Super Bowl, the Patriots are going to pick dead last in the first round of April’s NFL draft; that’s a much more radical handicap for success than anything proposed on the tax front. Oh, that is not even close to “a disservice to the readers.” The Times-Picayune served its readers in the best way it possibly could, as the local reactions to that illustrate. And the “nothing” here was still “news, opinion and perspective”; it was a commentary on the city’s boycott of the game. That’s far from a “waste” of an entire front page, and that front page probably sold many more copies than regular Super Bowl coverage (or anything else) would have, so “won’t someone please think of the cost of newsprint?” is disingenuous at best.